If you’ve ever wished you could take control of the sun and send some warm rays your way, you’re in luck. That’s exactly what the Sunflower Home heliostat is designed to do. 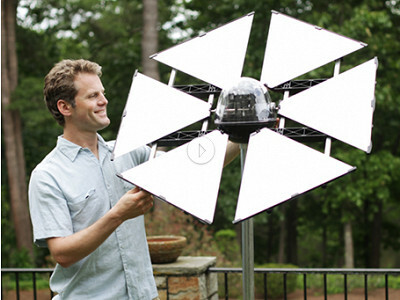 The pinwheel-shaped device tracks the sun throughout the day and uses angled mirrors to redirect sunbeams to wherever they’re lacking -- in a room starved of natural light, for instance, or a garden that’s too shady. It runs on solar power, so there are no batteries or wires to manipulate. You can set up the Sunflower to reflect light toward a specific target at a certain time of day. You could have it pour light into your kitchen window each morning, for example. The target has a range, so as the day passes, reflected light may travel over the surface of your house and shine into other rooms, too. The creators of the Sunflower are engineers WiCher Lim and John Koger, who are striving to make solar products more affordable, less complicated, and more mainstream. Their heliostat is ideal for people who’d like to work with solar energy but didn’t know where to begin. Increasing the natural light in homes is a great start -- natural light can alleviate eye strain caused by fluorescent lighting, and it can help offset seasonal affective disorder. Using natural light to brighten your home can also decrease your electricity consumption and carbon footprint. Just imagine your own personal sun. Where would you like to brighten up? Happy Earth Day everyone! I am very excited that the Grommet has decided to celebrate Earth Day by sharing our Sunflower with you. What better way to honor the mission of protecting our planet and enjoying our natural environment than with the Sunflower? The Sunflower is truly a unique "grommet" that is all about the sun. This intelligent mirror on motors can be placed in your yard to bring sunlight in through the existing windows of your home -- and it is completely solar powered! The Sunflower is essentially your own personal sun as it is completely self sustaining and brings sunlight wherever you want it to go. Save electricity by using the Sunflower to light your home instead of turning on the lights during the day. I hope that you'll bring some more of those feel good sunshine-y rays into your life with the Sunflower, so that you can enjoy the sun even when you're stuck inside! I love this idea! I used to work at the Griffith Observatory in Los Angeles; there is a coelostat there (similar concept, different purpose), and I used to reset it every Saturday and Sunday morning. Seeing a small version of this is really cool :-) I do wonder if the "petals" can be turned so as to direct light in different directions, or to focus light more in an area. Also, does the mechanism automatically find the sun for tracking, or do we need to point it in the right direction? I ask because the Observatory's coelostat needed to be manually set every day. Thank you! That's very neat about the coelostat at Griffith Observatory, we will definitely look into it as we are always excited to learn about devices similar to the heliostat! The petals can be turned to direct light in different directions, however I'm afraid that the spread between the petals may not be very far. The mechanism automatically finds the sun on its own. The Sunflower has a dual axis sun sensor based tracking system which basically means it has a light sensor to find the sun and then its computer will do the math to triangulate the sun's location with respect to its target -- and then the Sunflower will move to keep its target. You do have to "set your target" once during initial setup by physically moving the target rod on the Sunflower itself. After that, the Sunflower will keep the same target! Please feel free to keep asking questions, we would love to hear your thoughts! Does it add much warmth? (wondering if it could heat area to sustain citrus plants on an open porch in cold weather?) Does occassionally freeze here in Va. midland. @Angela That's a great question. Unfortunately the Sunflower will not add enough warmth to sustain a citrus plant on an open porch through the winter. If you had an indoor window that you could designate to your citrus plant, then the Sunflower could certainly help with that! We have successfully wintered a Meyer Lemon Tree and a Pomegranate Tree with the Sunflower here but we made sure to keep the trees inside for warmth. In terms of understanding the warmth the Sunflower can provide: If you imagine how it feels in a dark room when you step under the sun's rays shining directly through a window, you only feel the warmth of those rays when you step right into them. This is about the amount of warmth the Sunflower can provide. With an open porch, we would not suggest using the Sunflower because we imagine that freezing would occur over night and the Sunflower would not be able to provide warmth at night as the warmth it provides comes directly from the sun when it is shining (in the day time!). If you’ve ever wished you could take control of the sun and send some warm rays your way, you’re in luck. That’s exactly what the Sunflower Home heliostat is designed to do. 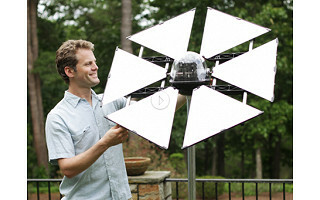 The pinwheel-shaped device tracks the sun throughout the day and uses angled mirrors to redirect sunbeams to wherever they’re lacking -- in a room starved of natural light, for instance, or a garden that’s too shady. It runs on solar power, so there are no batteries or wires to manipulate. You can set up the Sunflower to reflect light toward a specific target at a certain time of day. You could have it pour light into your kitchen window each morning, for example. The target has a range, so as the day passes, reflected light may travel over the surface of your house and shine into other rooms, too. The creators of the Sunflower are engineers WiCher Lim and John Koger, who are striving to make solar products more affordable, less complicated, and more mainstream. Their heliostat is ideal for people who’d like to work with solar energy but didn’t know where to begin. Increasing the natural light in homes is a great start -- natural light can alleviate eye strain caused by fluorescent lighting, and it can help offset seasonal affective disorder. Using natural light to brighten your home can also decrease your electricity consumption and carbon footprint.